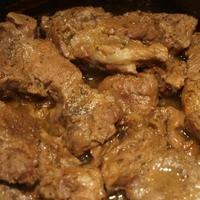 I adapted this recipe from a very popular cuban pork recipe on Allrecipes. I used boneless country style ribs instead of pork roast, because they were on sale and easier! I also boiled instead of roasting, because I find it makes the pork even more tender. I was very happy with the results. Incredibly flavorful and wonderful over black beans and rice! Heat a small, heavy skillet over medium heat. Add the cumin seeds and peppercorns to the pan; stir or shake constantly until fragrant and beginning to brown, about 2 minutes. Cool. Using a mortar and pestle, crush toasted spices with garlic, salt, and oregano to make a paste. You can also do this in the small bowl of a food processor. Transfer to a small bowl, and stir in orange juice, lime juice, lemon juice, sherry, and olive oil. Pour the contents of the bowl into a pot just large enough for each of the ribs to lie flat in the bottom, then place the ribs in the pot. It's OK if they are touching and a little crammed. Pour in 2-3 cups of water...just enough to mostly cover the ribs. Bring the pot to a high boil, then reduce to a low simmer. Simmer ribs for 1 hour, turning over once if a portion of the ribs is not covered by the water. After 1 hour, turn the heat up to medium and let the liquid boil down to just about half way up the ribs or less...about 1 hour. At this point the ribs will be mouthwateringly tender. Serve over black beans and rice or another starch dish. The thickened sauce is very pungent. I loved it over my ribs. It was a bit strong for my kids, who liked it mixed in the rice but not over the ribs. The ribs are wonderful served either way...dry or with sauce poured them. I really enjoyed this. I went easy on the sauce though as it is very pungent. This one saved my you know what! I didn;t have time to do my usual crockpot prep before leaving for work this morning. So I was a bit up the creek once I got home with 3 hours max to get dinner ready and 5 pounds of Country Style Ribs on my hands. I searched for a recipe that would enable me to cut the cooking time in half from a normal crock pot session. I found this one! I normally do not like to play around with the ingredients on a recipe that I am trying for the first time but in this case, I was not packing a trifecta of citrus and my spice rack did not have cumin seed but cumin already ground. I had NO fresh lime so increased quantities on both orange and lemon juices. I believe that cut down on the acidity as the lemons and oranges I had were quite sweet. The recipe worked like a charm. No surprises except that it was absolutely delicious. The entire family loved it and it is now going to be a repeat on our weekly menu rotation. Thank YOU!!! I served it with homemade black beans and white long grain rice. topped it with chopped fine white onion and queso cheese. REALLY REALLY GOOD and an awesome cooking technique! This looks delicious! I am not much of a pork person but this seems one of the recipes I would love. WhooooHoooo! My sister and mom cooked up 80 pounds of pork roast for my niece's wedding. My sis and I pulled apart every bit of it to nothing but the delicious strings of meat. I wanted the recipe, but she had fooled around with it and forgot to make a copy for me--I am making yours as soon as possible! I love, love, love Cuban pork! Very similar...but a little more flavorful. Like the ingredients, looks very flavorful. Is it like carnitas?